, an eminent and learned critic, was the son of a merchant in London, and born there April 22, 1679. After being educated in classical learning at the Charterhouse-school, he was, June 8, 1695, admitted of Queen’s-college in Cambridge, where he took the degree of B. A. in 1698. On July 7, 1701, he was chosen fellow of his college and the year following took the degree of M. A. and was proctor in 1709. In 1711, having distinguished himself by several learned publications hereafter mentioned, he was collated by Moore, bishop of Ely, to the rectory of Fen-Ditton near Cambridge, and to a prebend in the church of Ely; taking the same year the degree of LL. 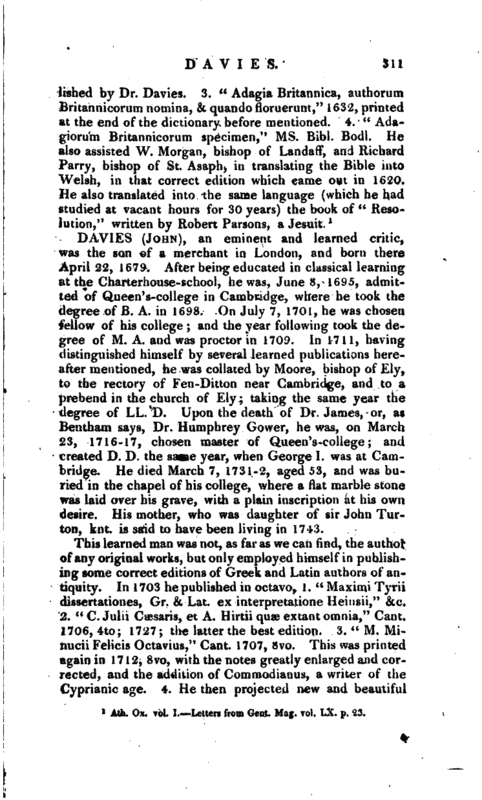 D. Upon the death of Dr. James, or, as Bentham says, Dr. Humphrey Gower, he was, on March 23, 1716-17, chosen master of Queen’s-college; and created D. D. the same year, when George I. was at Cambridge. He died March 7, 1731-2, aged 53, and was buried in the chapel of his college, where a flat marble stone was laid over his grave, with a plain inscription at his own desire. His mother, who was daughter of sir John Turton, knt. is said to have been living in 1743. This learned man was not, as far as we can find, the author of any original works, but only employed himself in publishing some correct editions of Greek and Latin authors of antiquity. In 1703 he published in octavo, 1. “Maximi Tyrii dissertationes, Gr. & Lat. ex interpretatione Heinsii,” &c. 2. “C. Julii Caesaris, et A. Hirtii quas extant omnia,” Cant. 1706, 4to; 1727; the latter the best edition. 3. “M. Minucii Felicis Octavius,” Cant. 1707, 8vo. This was printed again in 1712, 8vo, with the notes greatly enlarged and corrected, and the addition of Commodianus, a writer of the Cyprianic age. 4. He then projected new and beautiful | editions of Cicero’s philosophical pieces, by way of supplement to what Graevius had published of that author; and accordingly published in 170y, his “Tusculanarum disputationum, libri quinque,” 8vo. This edition, and that of 1738, which is the fourth, have at the end the emendations of his intimate friend Dr. Bentley. The other pieces were published by our author in the following order: “De Natura Deorum,” 1713. “De divinauone & de fato,” 1721. “Academica,” 17-5. “De legibus,” 1727. “De finibus bonorum & malorum,” 17-8. These several pieces of Tully were printed in 8vo, in a handsome manner, were very favourably received, and have passed, most of them, through several editions. He had also gone as far as the middle of the third book of Cicero’s Offices; but being prevented by death from finishing it, he recommended it in his will to the care of Dr. MeaJ, who put it into the hands of Dr. Thomas Bentley, that he might fit and prepare it for the press. 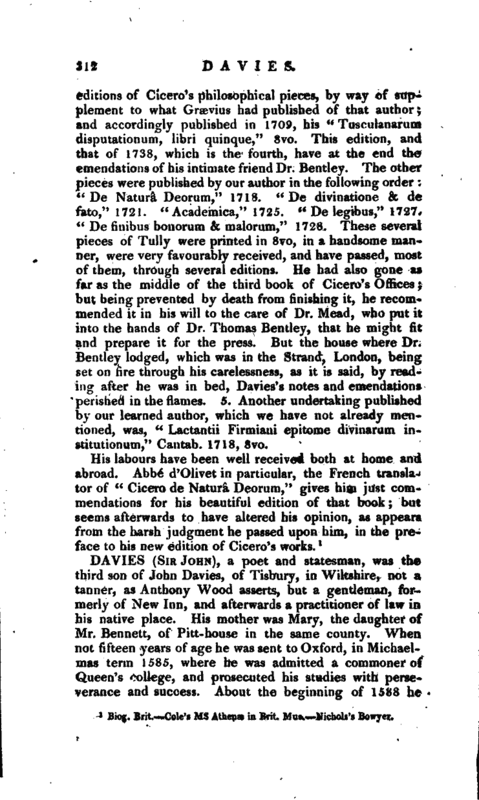 But the house where Dr. Bentley lodged, which was in the Strand, London, being set on fire through his carelessness, as it is said, by reading after he was in bed, Davies’s notes and emendations perished in the flames. 5. Another undertaking published by our learned author, which we have not already mentioned, was, “Lactantii Firmiani epitome divinarum institutionum,” Cantab. 1718, 8vo. 1 Biog. Brit. Cole’s ms Athens in Brit. Mus. Nichols’s Bowyer.